We will apply our casting experience to your needs. Offshore Sourcing: Nova Precision Casting's main thrust is in the production of low to medium order quantities and diverse capabilities with specialty alloys. To augment this offering we can provide competitively priced offshore investment and sand cast parts to meet your higher quantity requirements. 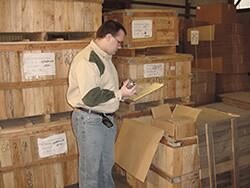 Using our Import experience, these cast parts can be shipped directly to you or shipped to our warehouse, inspected, inventoried and released to you in the exact quantities you require.